Between the seedlings we bought and the seeds we germinated, the garden is starting to look very promising. 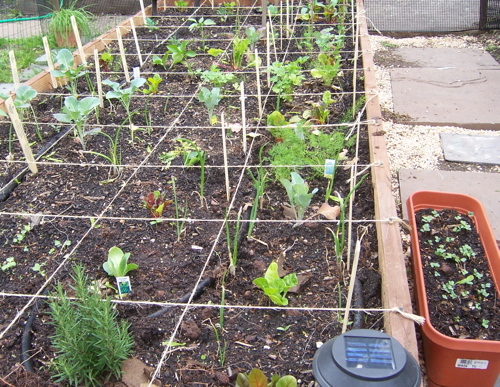 The windowbox at right hosts a thicket of young radishes; in the greenhouse sits another windowbox the same size planted with cabbage and kale. I worked at this all afternoon and I’m so bleary I’m struggling with words. In fact, I have no idea what I’m talking about. So: ocelots. I haven’t been able to construct much of a sentence since we drove to the pinko health food store in Princeton and found a car in a handicap space with a Bush/Cheney bumper sticker and another that said SAVING AMERICA FROM SOCIALISM. In the parking lot OF THE HEALTH FOOD STORE. I guess you could overlook the organics, the grassroots political organizing, the employees’ Che Guevara t-shirts, the holistic medicines and natural body products for the crazy-expensive prepared foods, which smell good enough to be a crime. I mean, sheeeeeeeeit. I’d egg that car, but it’d be a cage-free organic brown egg and those fuckers are expensive! This entry was posted in Be What You Say You Are, compote something, Flowers in a Frothing Green. Bookmark the permalink.